On June 10, 2008, Donaghy’s attorney filed a court document alleging, among other things, that Game 6 of the 2002 Western Conference Finals between the Los Angeles Lakers and Sacramento Kings was fixed by two referees. The letter states that Donaghy “learned from Referee A that Referees A and F wanted to extend the series to seven games. Tim knew Referees A and F to be ‘company men’, always acting in the interest of the NBA, and that night, it was in the NBA’s interest to add another game to the series.” The Lakers won Game 6, attempting 18 more free throws than the Kings in the fourth quarter, and went on to win the 2002 NBA Finals. The teams were not named, but the Western Conference Finals was the only seven-game series that year. The document claimed that Donaghy told federal agents that to increase television ratings and ticket sales, “top executives of the NBA sought to manipulate games using referees”. It also said that NBA officials would tell referees to not call technical fouls on certain players, and states that a referee was privately reprimanded by the league for ejecting a star player in the first quarter of a January 2000 game. Stern denied the accusations, calling Donaghy a “singing, cooperating witness”. BLOW ME, DAVID. Donaghy was one of three referees who worked the Pacers–Pistons brawl at The Palace of Auburn Hills on November 19, 2004, which ended in a fight between Pacers players and Pistons fans. Donaghy was also involved in another controversial incident in 2003, when he called a technical foul on Rasheed Wallace, then playing with the Portland Trail Blazers, for allegedly throwing a ball at another official during a game played at the Rose Garden Arena in Portland, Oregon. While Donaghy was leaving the arena, he was confronted by Wallace at the arena’s loading dock, where Wallace screamed obscenities at Donaghy. 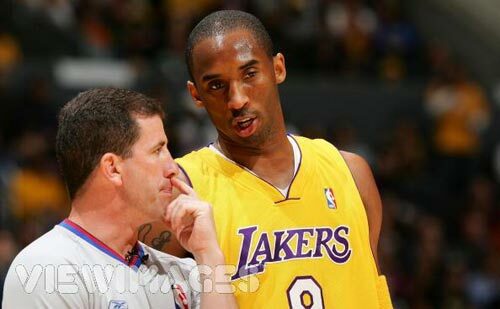 Donaghy claimed that Wallace threatened him, and after an investigation by the NBA, Wallace was suspended seven games. This was the longest suspension issued by the league for an incident not involving violence or drugs. via Tim Donaghy – Wikipedia, the free encyclopedia. BILL SIMMONS (http://sports.espn.go.com/espn/page2/story?page=simmons/070722): Congratulations to Greg Willard, Tim Donaghy and Eddie F. Rush for giving us the most atrociously officiated game of the playoffs so far: Game 3 of the Suns-Spurs series. Bennett Salvatore, Tom Washington and Violet Palmer must have been outraged that they weren’t involved in this mess. Good golly. Most of the calls favored the Spurs, but I don’t even think the refs were biased — they were so incompetent that there was no rhyme or reason to anything that was happening. Other than the latest call in NBA history (a shooting foul for Manu Ginobili whistled three seconds after the play, when everyone was already running in the other direction), my favorite moment happened near the end, when the game was already over and they called a cheap bump on Bruce Bowen against Nash, so the cameras caught Mike D’Antoni (the most entertaining coach in the league if he’s not getting calls) screaming sarcastically, “Why start now? Why bother?” What a travesty. Not since the cocaine era from 1978-1986 has the league faced a bigger ongoing issue than crappy officiating. ……………………….they should X the results from his entire refing carear……………….cause we will never know the depths of his manipulation!